We really like this omelet, and we haven't made it for a real long time. It is a good hearty breakfast, but also makes a good lunch or dinner. 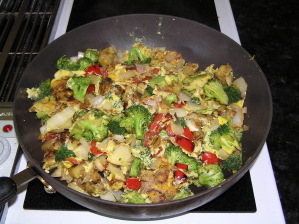 It uses Yukon Gold potatoes, red peppers, sweet onions and the magic ingredient, at least around our house, broccoli. We try to use farm fresh ingredients, but this time of year, we just settle for organic. Later this summer we'll try it again with local produce, but we always use Dry Creek Farm organic eggs. Click here for an illustrated how to guide. 06/19 - West Wind Farms We've updated a few things in our gallery of local farmers, so now Westwind Farm has its own page. Stay tuned while we improve our Farmer's Market web page. 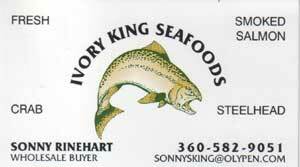 We were out at Nash Huber's stand in Dungeness and since it was Saturday between 1 PM and 5 PM, we ran into Ivory King Seafood. The lady right ahead of us bought the last halibut, an awfully good looking fish. We went for one of the salmon, which was caught locally, by line. We'll have to make our way out to Dungeness on Saturday or Sunday afternoons more often. We were driving around in Carlsborg and noticed a food truck parked by the side of the road. Its signage mentioned tacos, tortas and other Mexican goodies. Does anyone know anything about Fita's Catering? 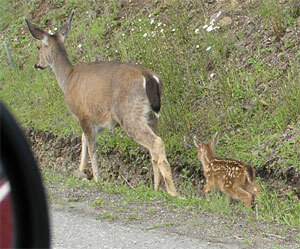 We spotted the first fawn of the season along Hurricane Ridge Road on our way up to the flower show along the Hurricane Hill Trail. It was hard to get a better shot since there is no shoulder along the road. 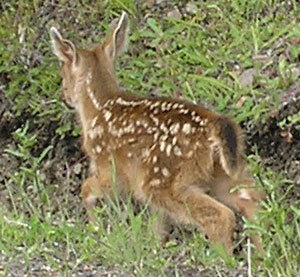 Usually, one doesn't see fawns until they are much older. This one was wobbling as it walked, so it must still be pretty new to the world. - The secret of chocolate has been revealed. We all know about chocolate and cocoa and cocoa trees and all that, but it always seemed that there was a bit of a gap between the cocoa nut on the tree and the chocolate bar in the supermarket. Having never seen a cocoa pod on a tree or in the produce section for that matter, we wondered just how big this gap was. 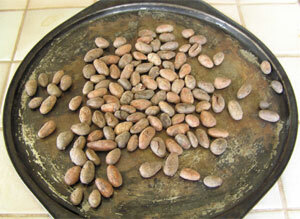 So, when we saw that Rose's Chocolates in Pike's Market was selling cocoa pods, we bought a bag of them. We finally got around to trying to roast them, and it was easy, even in our kitchen. You can see the high tech pizza tray we used on the left, and we are too embarrassed to show you the high tech oven we used for the roasting. Rest assured, you could roast cocoa pods in a toaster oven. It worked for us. The skins of the pods are thin, so once they cool you can peel them by hand. Inside is bitter chocolate goodness. Now all we need is some sophisticated equipment to balance the fat levels, a set of cocoa rollers and molds, million dollar mixing systems for adding milk and sugar, and we could probably make our own chocolate bars. But, why bother? These things taste great! Last month we noted a sign that appeared on a building at 31 West 56th Street in New York. It read, "Eleanor's Building - She Who Must Be Obeyed." Well, a fair bit has been revealed since our idle discovery. We were not the only ones who had our curiosity piqued. So, who is Eleanor? We have a theory. See if it makes sense.